Drop from new recovery high puts the pair back in channel off 1.3832 and in the inverted daily channel off June low (top at 1.4875 today). 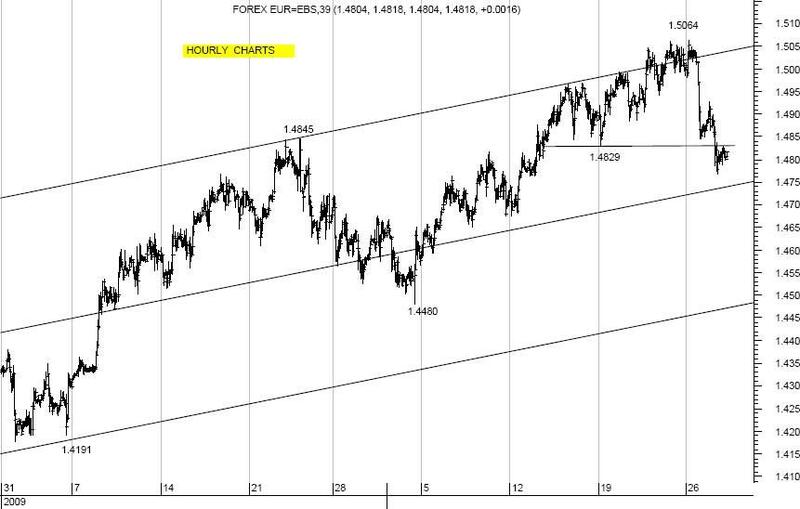 Support area at 1.4769 (current reaction low off 1.5064 + daily projection band bottom), with next levels at 1.4760/ .4753 (daily Long Term Moving Average↑/ 23.6% 1.3748 to 1.5064), where pause favored; If wrong, next levels at 1.4725 (daily envelope bottom), ahead of 1.4683/ .4679 (medium term reaction lows/ daily Uptrendline off June low): tough on 1st attempts. Resistance at 1.4870/ .4875 (daily envelope top/ see above), with next levels at 1.4900/ .4908 (daily Short Term Moving Average↓/ broken daily Medium Term Moving Average↑), ahead of 1.4928/ .4964 (reaction high hourly/ breakdown hourly), where pause favored. If wrong, next level at 1.5013 (breakdown hourly), ahead of 1.5064 (new recovery high off 2008 low) and 1.5105 (daily Bollinger top): tough on 1st attempts.